Battleground: Fantasy Warfare is a point-based miniatures game â€“ but without the miniatures. Battleground uses cards rather than painted models to represent your forces. This means a much lower price as well as easier transportation and setup, but donâ€™t be fooled â€“ this is not a â€œlightâ€� war game or a CCG. Battleground is a serious war game that will challenge you at every step, from army design and deployment to tactical maneuvers and command decisions until battleâ€™s end. Army Starters contain eighteen unit cards, a thirty-card Command Deck and two quickstart reference cards, plus the basic rules. This gives you all the cards you need to get started â€“ in play terms, each unit card is the equivalent of a boxed set of miniatures. All you need in addition is a flat surface, an opponent, some dice and a couple of dry-erase markers. 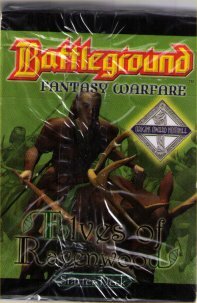 Other products in the "Battleground Fantasy Warfare" series. The Elves are a good starting faction, since they are fairly easy to play and they have units that can counter most other factions. A very versatile starting deck.